Veteran sports writer Jim Utter covers NASCAR for The Charlotte Observer and its racing site, ThatsRacin.com. In this space, Jim writes about all things NASCAR and other forms of racing which may also be relevant ... or not. 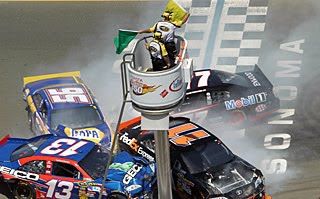 On September 29, 2010, the National Stock Car Racing Appeals Panel heard and considered the appeal of Richard Childress Racing regarding four penalties issued by NASCAR relative to the #33 NASCAR Sprint Cup Series car. This stemmed from post-race inspection following a NASCAR Sprint Cup Series event at New Hampshire Motor Raceway on September 21, 2010. The Appellants requested and were granted a deferral of the suspensions and fine until such time as this hearing could be convened. The Appellants did not contest that the car measured out of specifications upon inspection. The Appellants argued that, having received a warning about the car body of the #33 car being “too close” following the Richmond race, that it was inconceivable that they would bring a non-conforming car to New Hampshire. They argued that the left rear frame member was actually bent upward as a result of the car being pushed towards Victory Lane by a wrecker after the post-race burnouts, which resulted in the left rear measurement “hard point” being too high. To this end, they also presented an accident reconstruction specialist to demonstrate that a wrecker might bend up the left rear strut in the trunk under certain conditions. The specialists, however, indicated that such an occurrence would strictly affect the left rear because of the match-up between the wrecker pushbar and the angle of the racecar’s rear bumper. He went on to say that the corresponding right rear measurements should not be affected, in his view, nor the frame member deformed as a team representative had alleged. The Appellants also contested the severity and timing of the penalty. Claims that the wrecker caused the infraction were negated by the telemetry from the car which did not show a sharp impact spike; by the fact that the rear template still fit snugly across the entire rear of the car; by a visual inspection of the rear of the car which showed nothing of note in the way of damage; and a visual review of the videotape of post race assistance tendered by the wrecker which appeared as relatively gentle pushing. Of significance to the Panel were some additional facts which came to light during the hearing. Particularly of note were the facts that both rear hard points, left and right, were high, and that the rear of the body was offset on the frame. The Panel found that the penalties were consistent for infractions of this magnitude. Therefore, it is the unanimous decision of the National Stock Car Racing Appeals Panel to uphold the original penalties. The periods of suspension shall be adjusted from the date of the hearing. The Appellants have the right under Section 15 of the Rule Book to appeal this decision to the National Stock Car Racing Chief Appellate Officer. The Appellants submitted such a request and the fee immediately after the conclusion of the hearing. Theme images by Kativ. Powered by Blogger.